Running to the store is faster (depending on where the store is), as making your own puff pastry does take about 4 hours. However, most of that time is inactive time with the dough resting in the fridge. Don’t chill it too long between folds as that will make it difficult to roll out the dough. 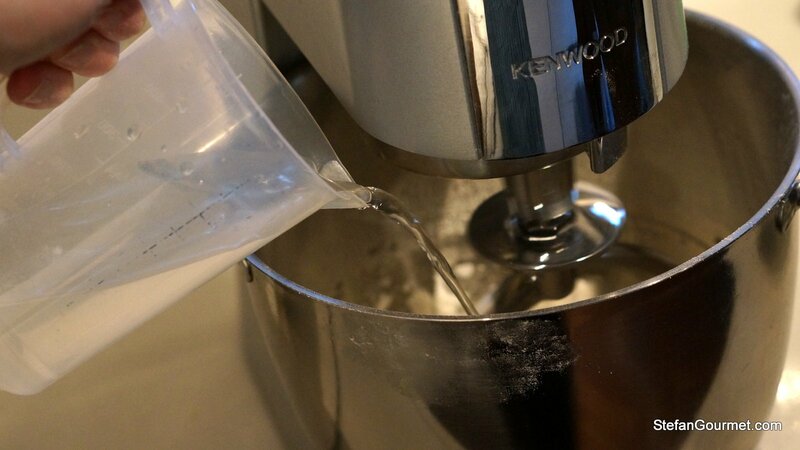 Sift 350 grams of the flour (all but 1/2 cup) and put it in the bowl of a stand mixer fitted with the paddle attachment. 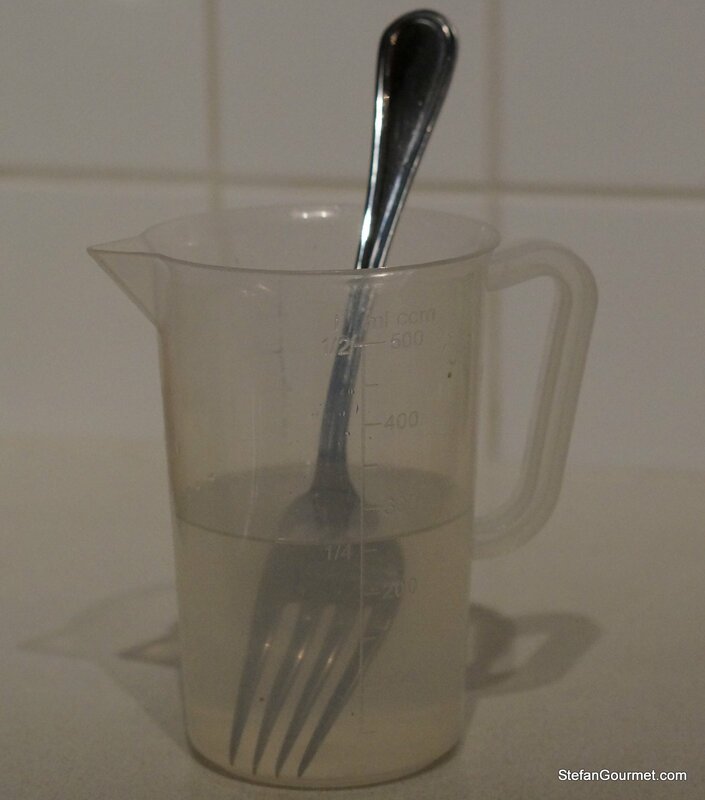 Put it on low speed and slowly add the water. 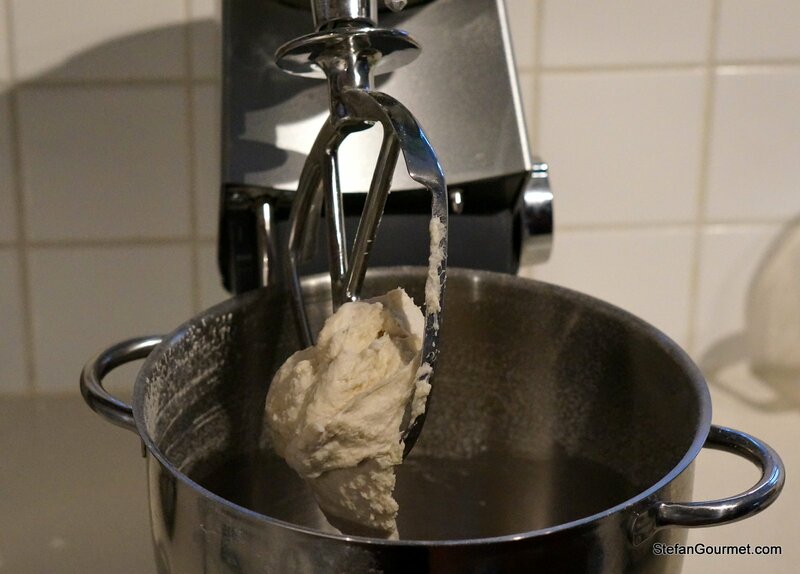 Process until the dough detaches from the sides of the bowl. Do not mix longer than necessary. Put the dough on a work surface sprinkled with flour. 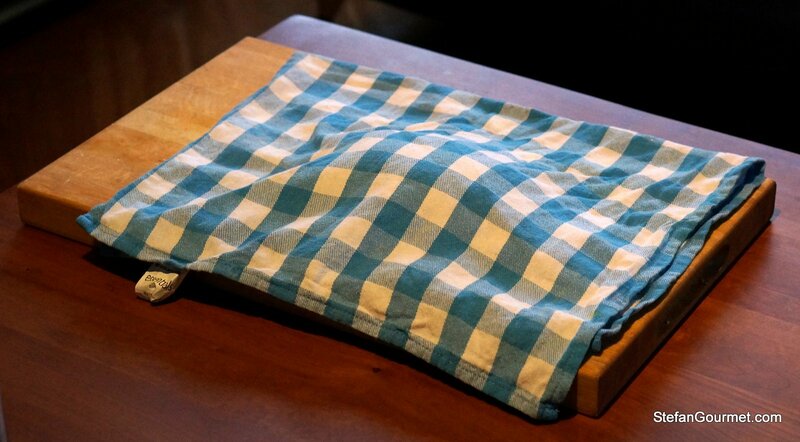 Cover the dough with a dish towel and allow to rest in a cool place for half an hour. 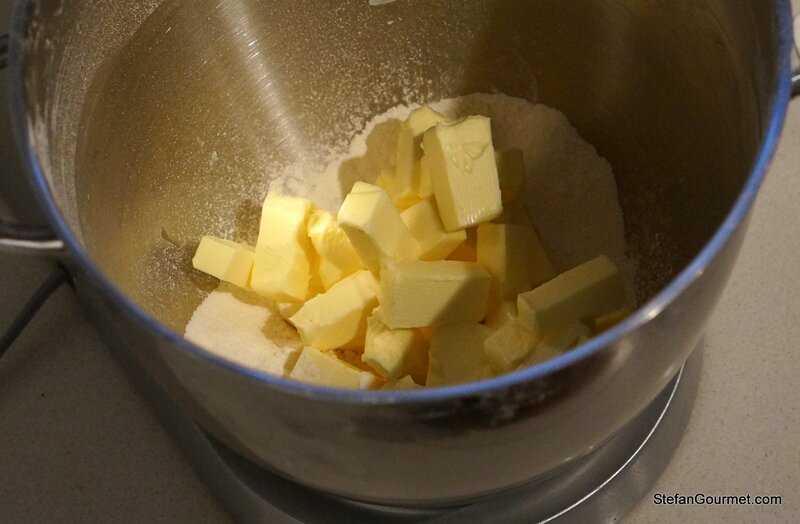 Meanwhile, cut the butter into cubes and put it in the bowl of the stand mixer with the remaining 75 grams (1/2 cup) flour. Dust your hands and a piece of parchment paper with flour. 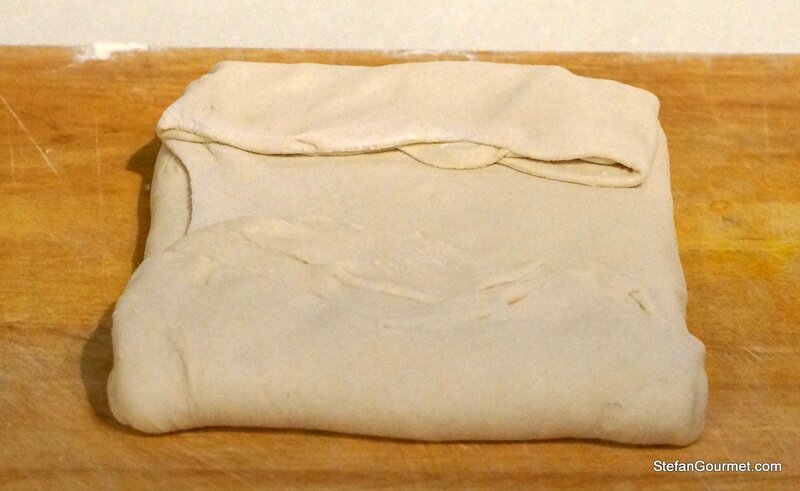 Put the dough on the paper and shape it into a rectangle of about 1 cm (1/3 inch) thick with your hands. Wrap the dough in the parchment paper and refrigerate for 30 minutes to firm up. 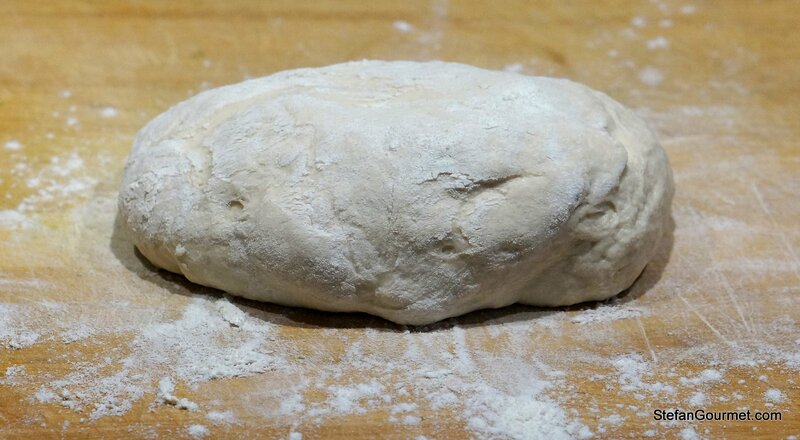 After the first dough has rested for half an hour under the kitchen towel, transfer it to a wooden work surface that you sprinkled with flour. 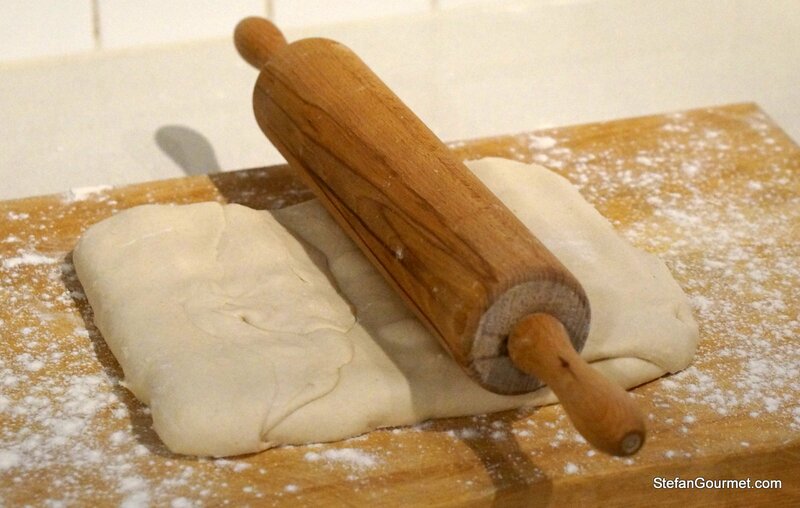 Use a rolling pin to roll out the dough. 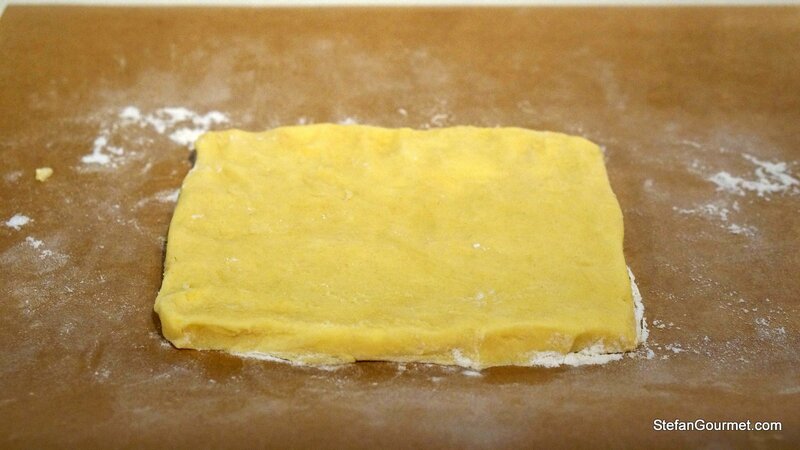 Roll out the dough into a rectangular shape of 50 cm (20 inches) long and 30 cm(12 inches) wide. Use the rolling pin also in a diagonal direction towards the corners to avoid ending up with a circle rather than a rectangle. 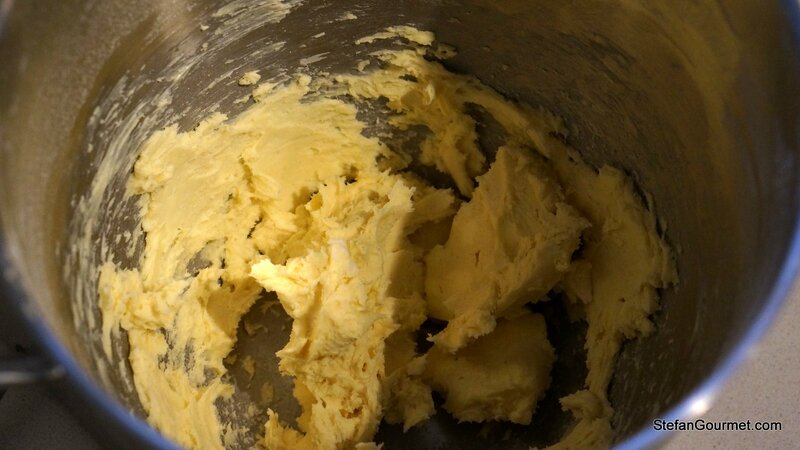 Take the buttery dough out of the refrigerator, unwrap it and put it on the center of the dough you just rolled out. Fold the dough such that the buttery dough is completely wrapped. Lightly beat the wrapped butter with the rolling pin to loosen it up a little. Roll out to a rectangle of 50 cm (20 inches) by 30 cm (12 inches), again also using diagonal movements. Fold 1/4 of the dough from the left to the center, and 1/4 of the dough from the right to the center, leaving about 1 cm (1/2 inch) empty in between. Fold over the two halves. You have now completed the first fold. Wrap the dough in parchment paper or plastic wrap, and refrigerate for 30 minutes. After 30 minutes, unwrap the dough and put it on the floured work surface with the folds towards you. Roll it out again to a rectangle of 50 cm (20 inches) by 30 cm (12 inches). Fold it again in the same fashion, this is the second fold. Wrap carefully and refrigerate. Repeat for a third fold and a fourth fold. After the fourth fold, wrap again tightly in plastic wrap and refrigerate for at least an hour before using. The puff pastry can be stored in the refrigerator for a few days, or in the freezer for months. To use it, cut off what you need and roll it out until it is about 2 mm (1/12 inch) thick. Remember that it will become difficult to work with when it warms up above 16ºC/60ºF. I am so impressed! I made croissant dough when I was young, but haven’t done anything like it since. You are very inspiring! Thanks Mimi. 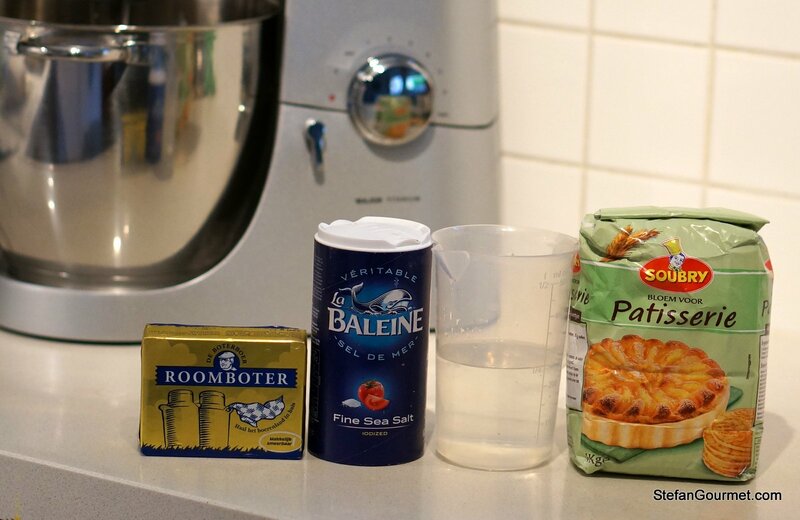 Croissant dough is almost the same (but with some more ingredients) and next on my list to try. I, too, would love to try making croissant dough ! And Stefan, you ALWAYS impress me – great job !! Handmade puff pastry is a labour of love and really worth the effort, so Stefan, what did you make using your beautiful puff? I have actually had a few successful ‘go’s at this way back when I did more baking ~ found it quite a therapeutic exercise!! According to Jamie Oliver of course anyone going to all that trouble at home has too much time 😉 ! Don’t know about that!!! I’m so glad you made this and that it went well! it isn’t that hard, but it does require patience and some careful handling of the dough to avoid ruptures. Can’t wait to see how you end up using the puff pastry. Hopefully you’ll blog about it! It was also on my to-do list, so this was just in time! Brilliant instructions as always, thank you. I made some during a cooking class … way back in 2002! and only once after that. But we didn’t use a mixer, it was all done by hand. I remember being given the advice to start with about 1kg of flour … if you are going to go to the trouble of making puff pastry … you may as well make lots of it! Now that I know I can do it, I will probably make more next time. Thanks, Richard. I don’t like dealing with any type of dough with my hands because it always sticks and I get very frustrated (especially when trying to take photos of the proceedings as well). The beauty of using the stand mixer and rolling pin is that in this method I hardly had to touch the dough at all, so hot hands are not an issue.